Though her high-rise residence at City Walk Condomini­ums in downtown St. Paul puts her less than a mile from the Minnesota State Capitol building, Patty Thorsen has to draw on her professional research skills and life experience to plan out a midmorning trip. Light rail is an option. There’s a stop just a block from her building’s front door, and now that Thorsen has “Trixie,” a lighter-weight, state-of-the-art electric wheelchair with mid-wheel drive, it’s easier to maneuver to and from the station. It’s not that simple, however. There are a number of fluid factors that deter­mine whether she will have time to take the train or will need to make an appointment to get picked up by a Metro Mobility bus. How crowded will the transit line be at her chosen time? At what station will it be easiest to detrain? And what would be the most expedient route from that station to the capitol’s handicap-accessible entrance, tucked below the imposing stairs leading up to the grand entrance? Thorsen was born with cerebral palsy and epilepsy in 1960, and her doctors initially questioned whether the Golden Valley native would be able to talk—an erroneous assessment that has become a running family joke. 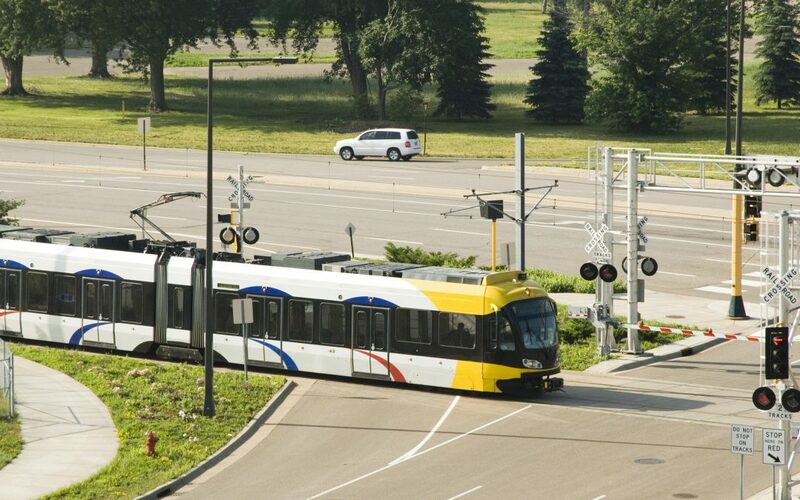 A St. Catherine’s graduate and “lifelong customer of mass transit,” Thorsen used Minnesota Val­ley Transit Authority’s reverse-rush-hour service to commute to and from her Eagan workplace until 2009, when osteoarthritis in her left hip and right ankle forced her to leave her job as a library assistant at Thomson Reuters and go on long-term disability. Though Thorsen is still able to walk short distances with the help of a cane, reduced stamina qualifies her for Metro Mobil­ity, a federally mandated, shared public transportation service “for certified riders who are unable to use regular fixed-route buses due to a disability or health condition,” according to the Metropolitan Council’s website. Just lately, though, the poli­tics surrounding Metro Mobility—and transit in general—have become increasingly complex and divisive. Thorsen played a role in the outcome, both as a member of the Citizens League’s 21-member bipartisan Transit Study Task Force, and as a vocal, visible advocate in the media and at rallies, where she passionately made the case that a functional, multipurpose transit system is essential to the state’s economic infrastructure. While there’s plenty of work to be done before Metro Mobility is sustainable (the legislature created a Metro Mobility Enhance­ment Task Force to make future budget recommendations), Thorsen’s journey from transit user to out-front campaigner pro­vides a primer on how an engaged citizen—and Citizens League member—can get active, get heard, and get things done. 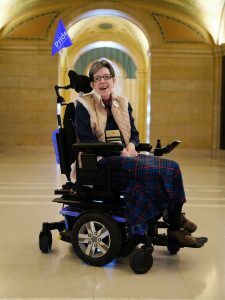 Once on long-term disability, Thorsen began her more flexible “encore career” as a volunteer at the Minnesota Children’s Muse­um, and then joined the Metropolitan Council’s Transportation Accessibility Advisory Committee, for which she now serves as vice chair. That made her a natural choice for the Citizens League’s transit task force, charged with making recommenda­tions to the legislature in advance of the 2017 session. In addition to absorbing “the landscape of the issue,” Thorsen was also sensing that her lived experience might be unique in the room. Eventu­ally, she brought that expe­rience out for a ride when a committee member insisted that service cuts were simply a matter of economics. “No, it’s not. This is people’s lives,” she remembers saying. “I kept reinforcing how I got to [each task force] meeting: Mass transit allows people to stay involved,” Thorsen says. In fact, this idea—that half the battle is showing up, and too many people are prevented from doing so—was not only a concept regularly repeated by Thorsen, it was unintentionally reinforced by a scheduling snafu. To get from downtown St. Paul to the 7:30 a.m. Citizens League meetings, which took place at St. Mary’s Greek Orthodox Church near Uptown Minneapolis, Thorsen scheduled her Metro Mobility rides a few days in advance. But one day the bus failed to appear at the appointed time. Thorsen later learned that the ride had been mis­takenly scheduled for that evening. Instead of merely using the snafu as a justifiable excuse for being absent, Thors­en treated it as a teaching moment at the next meeting. “It’s good that they see the realities, that I don’t just get in the car and go. There’s another step to it,” she says. Acknowledging the very real need to balance budgets, Thorsen learned to cast her arguments in financial terms, while simultaneously encour­aging committee members to engage in a more holistic brand of cost-benefit analyses. For instance, she asks peo­ple who depend on their cars to conduct a simple exercise: Leave your vehicle at home for one working day and use mass transit to meet all your needs. Then imagine having to do that every day, day after day, no matter the season. And then consider the finite resources required, including time and effort. Even when policymakers acknowledge the need for transit (and many do, on both sides of the aisle), the question still remains: Who should pay? JACQUELINE WHITE is a Minneapolis writer. When she needs to go downtown, she hops on the No. 4 bus.